The River Art Group is one of the largest and finest artist groups in the country. 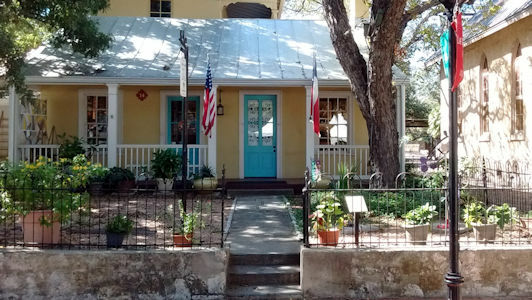 The River Art Group is housed in the historic Florian House within historic La Villita in downtown San Antonio, Texas. The art group was formed during the summer of 1947, when two small groups of San Antonio artists had the notion of doing a combined art show on the refurbished San Antonio Riverwalk. The River Art Group sponsors an art show on Tuesday, Wednesday and Thursday during San Antonio’s Fiesta celebration in April. The River Art Group holds their annual Fall Art Show and Competition the first weekend of October. Artists contribute works of art for a silent auction which benefits a local charity. The hard work and total dedication from so many of the members over the years has contributed immeasurably to the longevity of our self-supporting organization. All activities are directed and executed by members, including the daily operation of the gallery. Having their art showcased daily in our La Villita gallery is a primary reason so many local artists apply for membership. River Art Group has 254 artists from San Antonio and surrounding communities working in a wide variety of media. In the gallery you will see works in acrylic, oil, watercolor, pen and ink, pastel, photography, clay, metal, wood and more. Some artists also offer fine art reproductions of their work. Many artists are juried in for multiple categories. River Art Group is fortunate to have very talented artists in the group.